Carter says he's excited to advocate for a West 7th streetcar. He says rail/streetcar can bolster businesses better than buses. He wants to think of transit as connecting suburbs as well as airport and Minneapolis, and even Chicago via a high-speed rail to Union Depot. Have you in your adult lives, ever work in the private sector? Dickinson wants to be sure businesses aren't displaced/hurt by construction, but she wants more public transit. Anything we can do to get people out of cars is good, she says, and streetcars/rail are more popular than buses. Goldstein says the city doesn't have proper big-picture busing strategy. He wants buy-in from the West 7th Street community before moving forward with any streetcar plan, plus a means of paying for it. 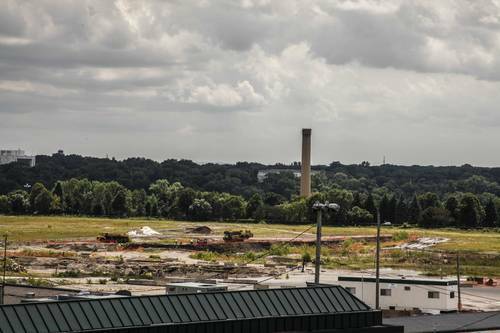 After about a decade of work, the St. Paul City Council has passed an ordinance guiding mixed-use development for the Ford plant site. A late change increases the percentage of housing for those earning very low incomes. Thao voted against the council's plan, and he wants the site to host more affordable housing. 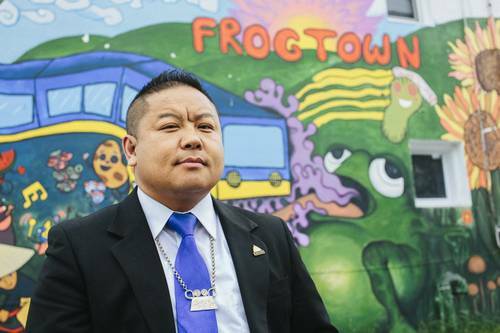 He previously said much of the city's affordable housing is clustered in his neighborhood, Frogtown, and the Ford site is an opportunity to add more in a new area. Carter supports the council's Ford site development plan. He notes the city is growing, and that's projected to continue. He says the Ford site is a "once in a lifetime opportunity" to add jobs, housing and expand the tax base. Dickinson says she generally supports the council's plan, and it could be a "beacon of sustainability" if done right. However, there are many questions on the plan. Regarding the proposed ballot measure to revisit the council's decision, she supports it as an example of "participatory democracy." She says there's still a lot of opportunity for public input on the plan. Goldstein says the timing isn't right. Ford hasn't sold the site or cleaned it up yet. "We don't really know what the pollution situation is," he says. He says the proposal was pushed through due to political expediency. Even with 10-12 years of meetings, that doesn't mean people's opinions are being listened to, he says. The Zoning and Public Realm Master Plan calls for between 2,400 and 4,000 housing units, a mixture of commercial and office development. It also calls for 20 percent of the development to be public parks, trails or open space. The plan, as passed, calls for high-density development, split into six districts. Among those districts would be four residential areas and two commercial areas. The residential areas would include homes, apartment buildings, townhouses, condos and possibly senior housing. Harris says he doesn't support the plan. He says the city's financial projections are off, and the environmental conditions aren't fully known. That said, he says jobs and housing are needed at the Ford site, but city needs to consider impact on the surrounding neighborhood. Weber to Carter: Did your campaign have anything to do with the bribery allegations against Thao's campaign? Prosecutors have declined to file charges against Dai Thao, a St. Paul City Council member who came under suspicion after bribery allegations were leveled against him in May. Asked about her lack of government experience, Dickinson says everyone running will need on-the-job training as mayor. She says her professional background, including as a consultant, shows she could handle the job. Also says she'd work with the deputy mayor and leverage her experience. Goldstein on why voters should make him their first choice: Says he's been someone who has focused on solving problems and calling out city priorities, not on being a politician. Weber to Harris: Are you the Republican in this race? Harris laughed a bit and said he has a progressive track record. He says he gets certain allegations because of his experience in finance, experience he says is crucial to running a city. "There s no basis for saying I have some sort of conservative cred." Weber to Thao: What do you tell people about the text messages that led to the bribery allegations? Thao says it was a coordinated political attack, but he forgives those who accused him. He says he wants to unite the city and has a proven record of fighting for the community. Thao just gave out his cell phone number, so head to facebook.com/mprnews if you want to hear it back. Carter is reinforcing his focus on education, noting that he's a product of St. Paul Public Schools and his kids go there, too. Dickinson says she thinks the public schools needs more arts programs to make them more attractive to families. Goldstein: Mayor should influence flow of city resources to schools to fund preschools, taking care of kids throughout the day. Goldstein says if Mayor Coleman had spent his time in office talking about education, "we'd be much further along" in addressing issues in schools. Part of Harris' education plan includes bringing in public libraries into certain targeted public schools. Thao wants to promote good character and respect among students. He says schools may need more social workers. "It takes a community to raise our kids." We're wrapping things up here, thanks for tuning in. Look for a wrap-up article later, or re-watch anything you missed on Facebook.